There are a lot of LEGO games out there. 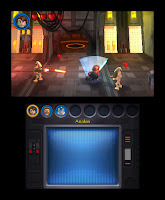 Indiana Jones, Batman, LEGO Universe, Rock Band... but LEGO Star Wars just seems to have something special. Not all that long ago, I was ready to write off the LEGO mini-genre as it seemed like it's time had come and 'stale' might have been an understatement. But then along came A New Hope a new hope- The Clone Wars. I have to admit, the 3DS' use of 3D does play a factor on this game. Just the sheer 'newness' of it is hard to shake off so as to keep the focus solely on The Clone Wars. And it's not like it makes a huge difference either, in fact it seems like developer Traveler's Tales didn't buy in to the potential gimmickry that the third dimension could have provided. Instead they used it to add another layer onto an already strong game. Yes, I said 'already strong'. And that's because TCW is a very nice action title. It does pretty much everything that past games in the series have done and adds in a few more. Grappling hooks are now used to pull items, force powers have more interesting applications and the things you build throughout the various levels are much cooler. Based on the cartoon series (that's pretty great in it's own right), TCW has many of the characters and storylines from that show well featured in it's narrative. What this means is that while LEGO Star Wars had you playing through the 'Prequel Trilogy', and it's sequel had you blasting through 'The Original Trilogy', part three follows the events laid out during all three seasons of the show. I've personally only seen a few episodes and I recognized one of them instantly during my playthrough. So if you watch the cartoon regularly, you know where all this is going- in fact, even if you don't watch the cartoon, you should have a good idea where all this is going. While we're on the subject of the Star Wars universe in general, TT has included a bunch of great characters to play as during 'free plays'. 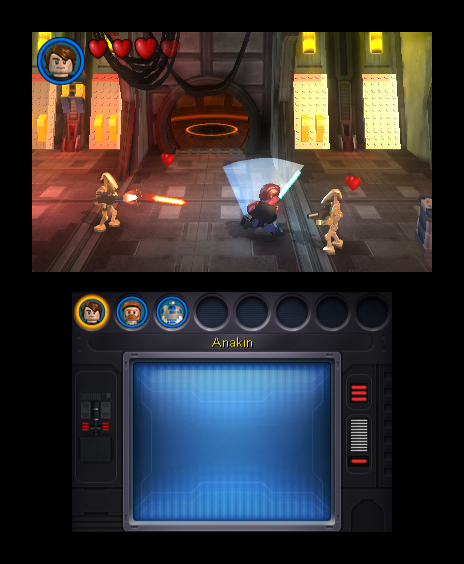 Much like in previous LEGO games, each stage opens up for free access after you clear it in the single player mode. And on the subject of single player- the story mode shines in this game as well. Most stages have a great assortment of Jedi, Clone Troopers, and Droids that make playing through them an experience with quite a bit of variety to it. In fact, combat changes pretty dramatically whether you choose to play as a Jedi or Clone. Even among the troops, there are differences. Just to give you some examples, the heavy trooper has a rapid fire cannon and explosives, the sharpshooter had a target ability, etc... Enemies are well thought out too, but they're confined to the events played out from the show. Which means there are a lot of battle droids. The graphics jump out at you, and not just because they're in 3D. 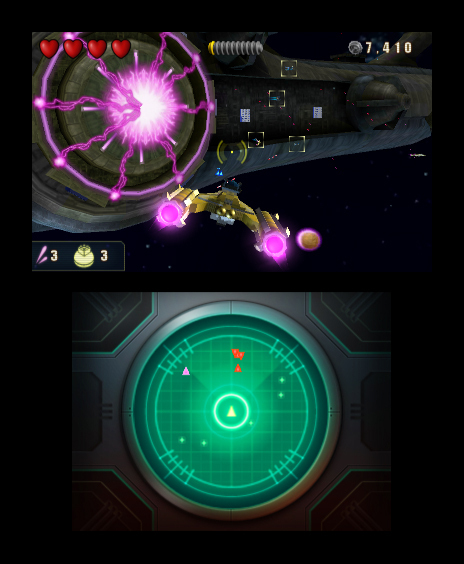 The 3DS is capable of producing some really nice visuals and The Clone Wars shows it. In fact, it's almost on par with the home console versions with the only real difference being some missing effects and the lack of more than one player character on screen at a given time (you switch on the fly). As I said above, the 3D screen enhances what's already there- it adds depth and, occasionally, some cool 'pop out at you stuff. This is most noticeable in the starfighter levels, which come off really well. One other area affected by the third dimension is play control. TCW mostly controls like a dream and the 3DS' analog pad is an amazingly cool portable approximation of a stick. Notice that 'mostly' right there? That's because there are some occasions, with the 3D turned all the way up, that it can become difficult to negotiate corners and ledges. It's not all that common and it in no way breaks the game, but it's there all the same. It would be easy to say, 'if you like Star Wars, get this game', but even if you don't like one of the greatest science fiction saga's of all time- this is a great initial offering for the 3DS and would be just plain old fun even if it was released somewhere down the line. 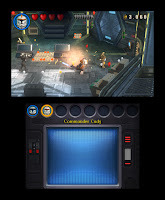 LEGO Star Wars III: The Clone Wars should be one of the first purchases any action fan makes for their shiny new 3DS.